As with any muscle or tendon in the body, the Achilles tendon can be torn if there is a high force or stress on it. This can happen with activities which involve a forceful push off with the foot, for example, in football, running, basketball, diving, and tennis. The push off movement uses a strong contraction of the calf muscles which can stress the Achilles tendon too much. The Achilles tendon can also be damaged by injuries such as falls, if the foot is suddenly forced into an upward-pointing position, this movement stretches the tendon. Another possible injury is a deep cut at the back of the ankle, which might go into the tendon. Sometimes the Achilles tendon is weak, making it more prone to rupture. Factors that weaken the Achilles tendon are corticosteroid medication (such as prednisolone), mainly if it is used as long-term treatment rather than a short course. Corticosteroid injection near the Achilles tendon. Certain rare medical conditions, such as Cushing?s syndrome, where the body makes too much of its own corticosteroid hormones. Increasing age. Tendonitis (inflammation) of the Achilles tendon. Other medical conditions which can make the tendon more prone to rupture, for example, rheumatoid arthritis, gout and systemic lupus erythematosus (SLE) - lupus. Certain antibiotic medicines may slightly increase the risk of having an Achilles tendon rupture. These are the quinolone antibiotics such as ciprofloxacin and ofloxacin. The risk of having an Achilles tendon rupture with these antibiotics is actually very low, and mainly applies if you are also taking corticosteroid medication or are over the age of about 60. Once a diagnosis of Achilles tendon rupture has been confirmed, a referral to an orthopaedic specialist for treatment will be recommended. Treatment for an Achilles tendon rupture aims to facilitate the torn ends of the tendon healing back together again. Treatment may be non-surgical (conservative) or surgical. Factors such as the site and extent of the rupture, the time since the rupture occurred and the preferences of the specialist and patient will be considered when deciding which treatment will be undertaken. Some cases of rupture that have not responded well to non-surgical treatment may require surgery at a later stage. The doctor will immobilise the ankle in a cast or a special hinged splint (known as a ?moon boot?) with the foot in a toes-pointed position. The cast or splint will stay in place for 6 - 8 weeks. The cast will be checked and may be changed during this time. 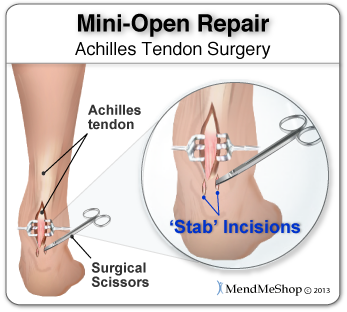 Operative treatment involves a 6cm incision along the inner side of the tendon. The torn ends are then strongly stitched together with the correct tension. After the operation a below knee half cast is applied for 2 weeks. At 2 weeks a brace will be applied that will allow you to move the foot and fully weight-bear for a further 6 weeks. After this you will need physiotherapy. Surgery carries the general risks of any operation but the risk of re-rupture is greatly reduced to 2%. The best form of treatment is controversial with good results being obtained by both methods but surgery is generally recommended for patients under 60 years of age who are fit and active with an intra-substance tear. sonjacanedo is using Hatena Blog. Would you like to try it too?